What exactly do you want out of life? Most people would say something like, “I want to be happy and have a lot money.” It’s so ubiquitous that it doesn’t mean much. Here is a more interesting question, a question perhaps you’ve never considered before: Can we be happy with no or very little money? Why are we so obsessed with money? Because that seems to be a greater determinant of how our lives turn out. Money can only buy a certain kind of happiness. We’ve all heard the saying “money can't buy happiness”, but what does it actually mean? We often think if we have all the money to buy the things we want, take a dream vacation, and live in our dream home, then we’ll finally be happy. However, money comes from working. We often have to work enough to earn a high income, and that is often associated with long work hours that leave very little time to spend with loved ones or do activities we enjoy. This lack of time can have a negative impact on social relationships, and with less time to spend the extra money, this can actually make us more miserable. The truth is that you can have all the money, but we can't buy the escape out of an illness. Most of us are not aware of it when we are healthy because we are so busy doing our daily chores, and as time goes by, we forget what is important for us. That has all kinds of negative consequences on our psychological well-being. Grace will teach you how to shift your beliefs about money, using the power of reframing, and how to spend in line with your values so you can spend money and feel happy and fulfilled about yourself. Would you like to know more? Scroll to the top and download now. I loved this book! Our mindset creates the life we have, and when you can change your mind, you can change your life! very basic.... not life changing. nothing really new presented here. do not buy stuff that does not make you happy. I LOVE Grace, Bruce Walker, and Leesha! What inspiration!! They always remind me of things I knew and practiced in my last earthly life! Wonderful!! Nothing short of mind-changing, which means it is also life-changing. As soon as I am through it, I am starting again. I have highlighted so many parts! This fits in with my focus of wanting to simply enjoy life rather than bitching and complaining. Practical (if you believe them) information and application. Well done! This book is a revelation... It's an amazing eye-opening experience. A must listen for those wanting to change their lives for the better, and an understanding of their past, present, and future experiences!!! Great book. Want to improve your life, your outlook on virtually everything under the sun? Then get this and never stop listening to it, and it will do just that. Best info That has ever crossed my path. Excellent book! Has helped me bring different forms of wealth into my life. I highly recommend this book!!!!! This is a great book. The same concept as many other writers on this subject yet it is presented in a slightly different way. It works for me. 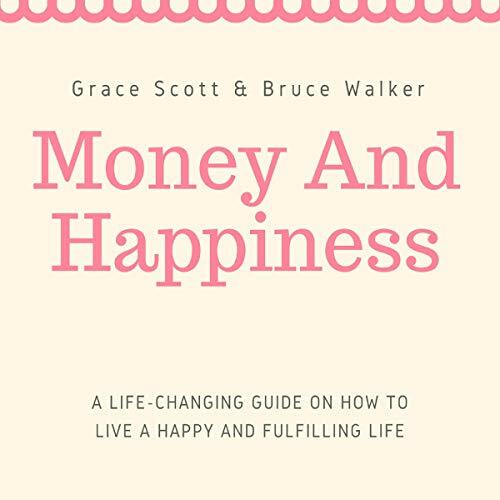 Grace and Bruce Walker Hicks have presented a great concept about Money and Happiness. But the concept can be used for anything. The key is to retrain your mind about how you think and how you feel. Fear is a very strong emotion! The guide questions made me realized so much when it comes to happiness. That money is of no value and that our happiness shouldn’t depend on material things. It’s interesting to note that the author has included the mindset and skills we need to acquire to achieve happiness quickly and possibly. Yes! I agree with the author that we can be happy with very little money, with proper mindful of our life! Learn some tips from her. So what is money all about? is it badly needed and how much time should we spend on earning and spending it as well? Think about it! This pretty reliable audiobook will give you the answers you're looking for! This book really makes me think about my values and how to reframe and realign them to the best of it! Life is not all working and no enjoyment. I used to be selfish and self-centered when it comes to handling finances, dealing with my family, and managing my resources that I was no longer happy at the end of the day. I feel so empty that I often result to negative decisions and actions. This book gave all the answers I need to have a fulfilling and balanced life that I’ve been yearning for. I have read happiness books in the past and have listened to few audiobooks, but none of them has touch my heart like this audiobook did. I totally agree with this book and I have not been this inspired. This sure changed my perspective when it comes to money and happiness. If there’s one thing I’m definite of after listening to this book, it is that money can’t really buy happiness. The author has unique point of views and I didn’t have a hard time comprehending them. It’s just fantastic! This wonderful piece is helping me to bring back the happiness in my life that was once gone. The strategies and the methods of thinking are just brilliant. Compared to other books, this has a more subtle and simple book cover and has piqued my curiosity. I began to discover the real meaning of happiness and it isn’t just about money or fame. It’s all about building good relationships with others, being healthy in all aspects of our lives, and so much more! So pleased with this audio piece. Getting this book has been a wise decision as it’s slowly assisting me in deal with money emotionally and psychologically. This is one compelling listening piece that is helping me get a rewarding financial well-being. I will be buying the ebook version of this as well.